In this chapter of the Brotherhoods life, we discover that Vishous, too, has a deep tumultuous past (a ruthless heartless warrior of a father, a “survival of the fittest” upbringing, and an absent mother) which has hardened his heart such, that it doesn’t allow him much leeway for love in his life. In fact, he has bonded so deeply to “Butch”, which is a fairly new feeling for him, that he actually feels like he is in love with him (I didn’t see that coming!!). In the past installment, we see Vishous trying to comprehend the love between Marissa and Butch. He imagines what it would be like to love someone that deeply, trying to come to grips that it will never be that way for him and Butch, and possibly him and anyone, for that matter. After a near fatal shooting, he ends up in a human hospital and meets his surgeon, Dr. Jane Whitcomb. unbeknownst to her, he instantly starts bonding (in the typical “Mine” vampire way). His brothers “break him out” of the Hospital (daylight is coming, and he needs to hightail it out of there, before he turns into a Vampire crisp). Low and behold, as they escape, “Rhage” throws Dr. Jane over his shoulder, caveman style, and steals her away as per Vishous’ demands (much to her resistance). While being forced to care for him in the Brother’s compound (the Brothers have promised her that she will be released as soon as Vishous is well), Dr. Jane realizes just what she is dealing with. Despite her “captive” status, she takes advantage of learning as much as she can (for the sake of genetics!). She has to consistently remind herself to keep in check, since she is discovering that she is quite taken by Vishous’ charms. There was nothing more attractive to her than when a man was into smart women. I won’t go any further than that. There is so much more to this book (more personal discoveries, spiritual awakenings, and an answer to where Vishous truly comes from) that make this book an exciting read. The angst in this book is well suited to the story. Lots of it, but not just for the sake of creating empty drama. The story, in my opinion comes full circle. Through this book, we also see John Matthew through his transition, his discovery of who his real father is, and how much he takes after him. We get a glimpse into the lives of the “Chosen” females and their hierarchy on the “Other Side”, and the future breeding plans of the species as a whole. Alright….I just finished this book and I am in love with V and Jane. I think this is my favorite so far because I can relate to Jane a lot. I am kind of sad with the way Jane is now. I really hoped that she could still be “the same”. Hopefully in the other books she can regain her form back. Every time I picture her my sight is blinded by the bright light (LOL). This series is the best and I enjoy reading them. So, its off to the next one, Lover Enshrined. OOH, I can’t wait! I am tingling all over! 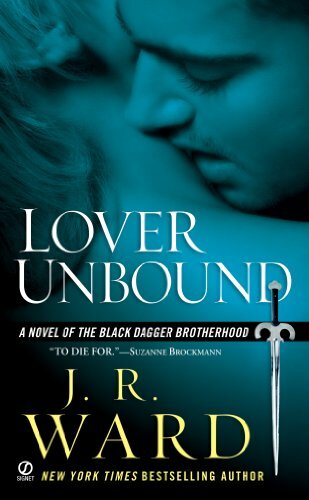 For the JR Ward Black Dagger Series, do you suggest we read all the books in order to understand what were reading or can I just read Lover Unbound? Hrmmm… well, I read them in order and enjoyed the story as it progressed (each one got better and better, and actually, #3 was my favorite, but this one was a favorite, too). Each book is written sort of as a “standalone” as it focuses on one new potential couple (and their own new story), but the story of the “Brotherhood” as a whole (the other characters), and the battles they face is an ongoing one throughout the series and expands as the series progresses. However I see below, that Kayleigh read this one first and loved it the most, so I am assuming that she wasn’t confused while reading it. I would recommend the series as a whole, but I know TONS of readers who say THIS one is their absolute favorite. I was wondering where to go after reading and re-reading and re-reading Fifty Shades and guess what??? I found a series that I can’t stop reading. From the first book to the third I am caught up in the drama of the BDB and can’t wait to start reading this one. After Fifty, this is by far the best series ever!!!! My favorite series ever, Cheryl!! AGREED!!! I am so glad I found your blog! I enjoy reading series and found this series on your blog. I am one of those people who was over the whole “vampire” series but I decided to read the first one in this series. I just finished this book and LOVED IT! I think this one is my favorite along with book #3. The book did go a different direction than I thought it would. Thank you for the great recommendation!